Giuseppe Arcimboldo was a 16th century Italian artist who painted ‘portraits’ made up of fruit, vegetables, flowers, etc. They are wild, fantastic things and I remember first time I stumbled across them I was surprised that something so surreal and modern-looking could have been painted so long ago. But that’s the vanity of the present for you. Another vanity is thinking that the stuff I make up could be funnier than reality. Not a chance. This cartoon was inspired by the work of Cecilia Giménez, an old lady and amateur painter in the town of Borja in Spain who decided that she could fix the decaying image of Christ painted on a wall of her local church with a little touch-up. The result is phenomenally brilliant in the branch of art I care about most – comedy. I feel like giving the poor old girl a hug. Apparently she’s distraught by all the attention. Tourism, however, has since boomed as people flock to see it. Shops, restaurants, cafes, hotels are all dong well. God works in mysterious ways. 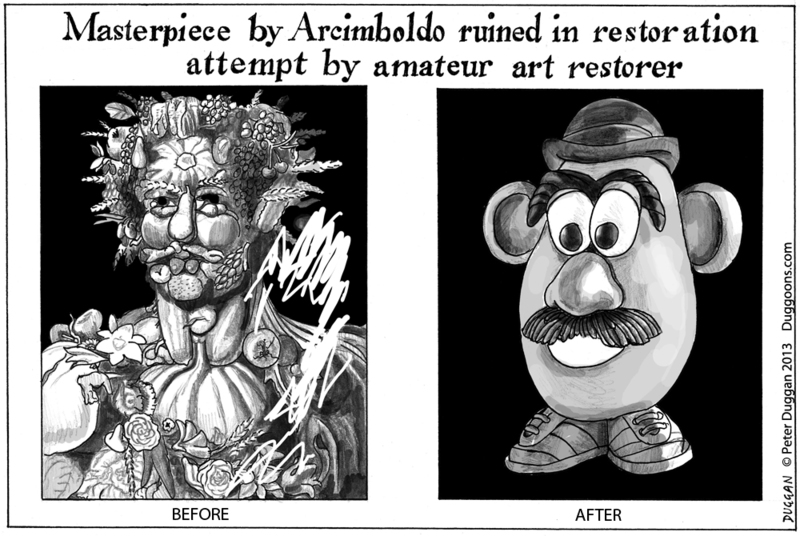 My take on this was to have a damaged Arcimboldo portrait ‘restored’ into another vegetable portrait – Mr Potatohead. Although dumber and simpler it does not necessarily require less painterly skill, which makes it sillier.